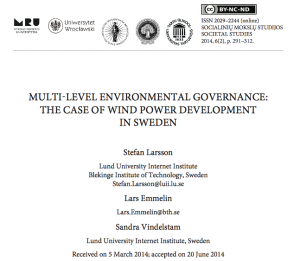 Vi publicerade nyligen artikeln Multi–Level Environmental Governance: The Case of Wind Power Development in Sweden i tidskriften Societal Studies. Vi har bland annat empiriskt studerat effekterna av införandet av det svenska s.k. kommunala vetot gällande prövningen av vindkraft. Artikeln ingår även i avhandlingen Law and Spatial Planning. Socio-legal Perspectives on the Development of Wind Power and 3G Mobile Infrastructures in Sweden, som jag försvarade i september 2014. Ladda ner artikeln i fulltext [pdf] här. Författare: Stefan Larsson, Lars Emmelin & Sandra Vindelstam. At national policy level in Sweden, the importance of development of wind power is emphasized. However, the actual implementation is highly dependent on local permit giving for windmills. The legislation governing the permit giving has been revised in an attempt to make the local processes faster and to shift the permit process towards a more regional environmental process as opposed to a more plan-based municipal process. By tradition in Sweden, the local, municipal level has had a strong mandate in land use planning which is often referred to as the “the municipal planning monopoly”, which means that there is a tension whenever a legal proposal seeks to diminish this “plan monopoly”. The legal investigation suggesting changes in the law on permit-giving stressed the need for strengthening the regional assessment, which led to a compromise called the “municipal veto-right”, where the regional environmental permit needs a formal approval from the municipality for the permit process to continue. This study investigates both the legal development of the so-called veto-right as well as what it empirically has led to, and how it is perceived by the industry as well as concerned parties. For this reason, a sample of 30 regional permit cases has been collected, and a limited number of interviews have been conducted with judges in appeal courts and regional handling officers assessing turbine applications. The results indicate that the industry sees the “veto” as leading to problematic uncertainty in the process at regional level and, therefore, prefer to keep the applications at a level that entitles them to use the municipal permit system which is determined by height and number of turbines. This is a consequence directly opposite to what the legal commission aimed for when revising the legal system. Denna sida drivs av Stefan Larsson, inom ett pågående forskningsprojekt om vindkraftens prövningsprocess, finansierat av MiSt och Naturvårdsverket. Läs mer om projektet här. I projektet ingår även professor Lars Emmelin och Ted Kransby. Läs mer om oss här.